Hakone is one of the most beautiful day trips you can take from Tokyo. It’s only a short 2-hour train ride away and transports you from the out of the metal metropolis of the city, into the lush green landscape of the Japanese countryside. Hakone is famous for their hot spring onsens, stunning view of Mount Fuji across Lake Ashinoko and unparalleled natural scenery. For many people travelling to Japan, time is short, and you need to pack in as much as you can. 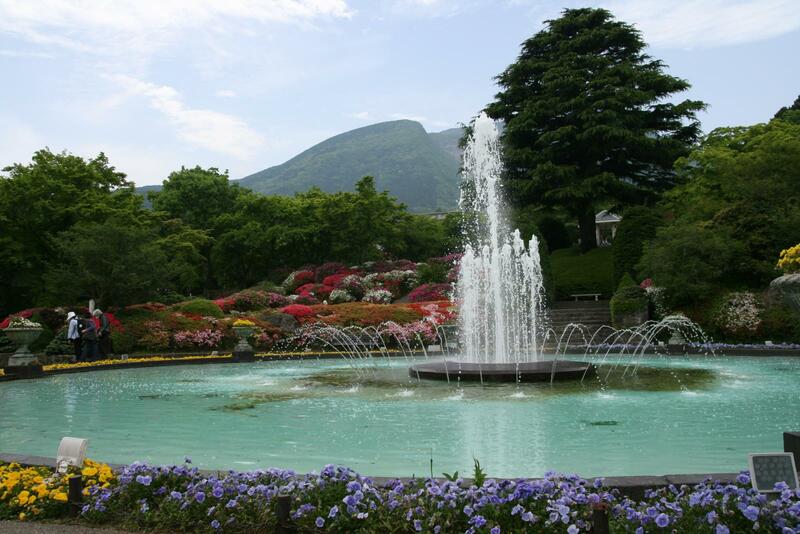 Even if you only have time to go to Tokyo, Hakone is easily doable as a day trip from the city. Getting out of town, even for just the day, is such a valuable experience to see another side of this country. I’d recommend spending the night in Hakone if you have the time since seeing it at night and early in the morning when all the day trippers aren’t filling the streets is absolutely incredible. Plus, extending your trip overnight gives you to an opportunity to see sunrise and sunset across Lake Ashinoko. If you're departing for Hakone from Tokyo, be sure to travel via Shinjuku Station on the Romancecar or Odakyu's limited express train. Despite being named the Romancecar, there is nothing particularly "romantic" about the train itself. But it is a charming, retro model of the old-fashioned trains which would take travellers to and from Hakone decades ago. They wanted to preserve that old world charm. On the train, you’ll see some magnificent views of Japanese scenery as you make your way into Hakone prefecture. The views are perhaps the reason for the name "Romancecar" since they are stunningly emotive and almost dreamy. You'll pass the Pacific Ocean, the rural countryside, dozens of mountains and even a glimpse of Mount Fuji (if you’re really lucky). The whole journey should take approximately 85 minutes. There are four different Romancecar trains which run from Shinjuku to Hakone. Each one is a little different and offers up a variety of seating arrangement. All these cars require reservations in advance. You can book your seats up to a month in advance, and if you're travelling during a busy period, I recommend making sure you reserve as soon as possible. The ticket reservations cost ¥1,190 (USD 12) and there is an additional Limited Express Surcharge of ¥1000 (USD 10) you pay when you board. This surcharge surprised me since I had my printed reservation forms from Odakyu and assumed these were also my tickets. Turns out you have to pay both the reservation charge and the travel surcharge as well. Keep this in mind, so you don’t look as confused as me! One of the formats of the trains has two Observation cars which offer up larger windows as well as a skylight so you can better appreciate the scenery. These seats are usually the first ones to be booked up so if you’re hoping to get one be sure to look for the VSE and LSE trains and book fast! The VSE also offers Saloon style seating are 4-person booths, with huge windows and lots of privacy as well as a small table if you want to have a picnic. The only issue here is that you have to buy the entire set of 4-seats in your reservation. Even if you're just two people, you’ll have to buy all four seats. That being said, we decided to buy it out ourselves on our trip for the experience, and it was totally worth it for just the one-way trip. If you’re looking to save a bit of money but more importantly TIME, be sure to buy the 1-day "The Hakone Free Pass" from the ticket counter in Shinjuku station. This pass costs 5,140 yen for a 2-day adult pass ($51 USD). This also includes your Limited Express surcharge as well as ALL transportation within Hakone. This means all boats, trains, cable cars and ropeways will be covered under the pass. There are also some additional discounts you can receive on food, attractions and more. Many people have done the math, and even if you do the bare minimum on this route, you will at least save a few dollars. But the real saving comes when you don’t have to line up at every single ticket counter. You might think, "but are there really that many?" The answer is, YES! Once you get through this post, you’ll see what I mean! We opted for the 7 am train to Hakone. We wanted as much time as possible to explore, and I recommend doing the same. Hakone can get very busy and the earlier you go, the more time you have to enjoy the peace and quiet that comes without the throngs of tourists. Grab yourself some treats at the convenience store before getting on the train to enjoy on your journey. If you don’t have the time or forget, not to worry, there are food carts which come by during your trip, and there is even a small café area where you can get your coffee or tea and snacks on the train. After travelling across the stunning Japanese countryside, you will arrive at Hakone-Yumoto Station. This station first opened in 1888, and the historic nature is very apparent upon stepping off the train. Despite only being a few hours outside of Tokyo, this place feels like entering an entirely different century. Stretch your legs after getting off the train with a short walk around Shōtengai. Shōtengai is the largest shopping street in Hakone featuring dozens of different souvenir stores and food stalls selling local specialities. Take a moment to walk across the Ajisai Bridge right across from Hakone Station. The iconic bright red looks remarkable against the green tree lined background. After grabbing a few treats, head back to the station to get onto Hakone-Tozan Railroad. The Tozan Railroad is the only mountain railways in Japan, making the journey all the more special. In the summertime, hydrangeas bloom along the train track so close you could almost reach out and pluck the pedals off as the train chugs along. Be sure to get a window seat since the view is extraordinary any time of the year. Take the train until you arrive at Chokoku-no Mori station. Here you'll find the Hakone Open-Air Museum, featuring hundreds of outdoor sculptures set into the natural landscape. The museum opened in 1969 and ever since visitors have adored wandering along the hillside, taking in the breathtaking views of the valley juxtaposed with awe-inspiring pieces of art. There are over one hundred sculptures from artists such as Auguste Rodin, Niki de Saint Phalle, Aristide Maillol and Henry Moore. When we visited, I was hesitant to go inside since the price of admission was 1600 yen (USD 16) which seemed a bit steep considering I didn’t know much about the museum going in. But let me tell you, I’m soooo happy we decided to do it. I would have paid double! It is like no other museum I’ve ever visited. The sculptures are a mix of modern and contemporary with Japanese artists intermingled wth international aritsts. If you have kids, it’s a blast for them as well since many of the exhibits are geared towards children. At the back of the park, there is a large footbath with water from the hot springs where you can rest your feet. If you didn’t bring a towel to dry off, they sell small ones for 100 yen with a cute logo of the museum printed on it. A cheap and cheerful souvenir! Once you're finished at the museum, make your way towards Gora Station. You can either go back to the train station you came from and take it one stop or choose to walk along the one road to Gora Station. I recommend the walk since it’s not too long and very peaceful. If you choose to walk, along the way you’ll pass the Gyoza Center. This establishment has been serving up incredible gyoza for years in their three storey building but in 2018 they suffered a devastating fire which literally turned the entire building to ash. But, as recently as March 2018 they started serving up takeout once more in a makeshift building beside the rubble. Try to give them a visit and support them to help rebuild their new restaurant and enjoy some incredible gyoza while you’re at it. If you got the “Free Hakone Pass” you get free entry into Gora park. A great place to sit and rest your feet if you didn’t get a chance to reset at the Hakone Open Air Museum. Without the pass, entry is a steep 600 yen for a walk in the park but if you can get in for free it's a lovely little place to experience a variety of beautiful flora and fauna. If you're feeling hungry, stop off at Chunmoto, a small soba noodle shop tucked behind the train tracks. The set meals are slightly more expensive than you’d pay elsewhere, but considering you’re at the top of a mountain, the slightly inflated price seems reasonable. Try the Yama Soba, this comes with grated mountain yam on top of chilled soba noodles. They have the same kind of texture as natto which can take some getting used to, but once you start liking it, it gets addictive. Yama Soba is very specific to Hakone so trying it in this setting is highly recommended. 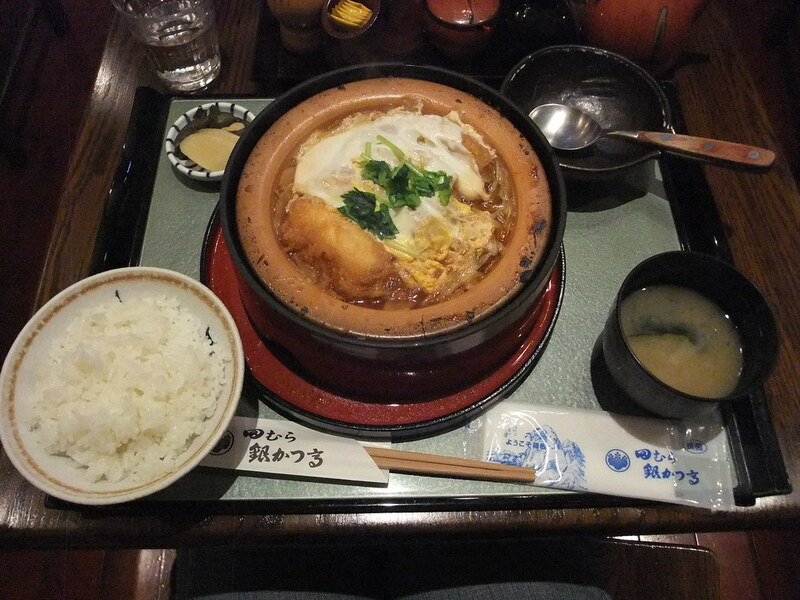 If you’re looking for something a little more popular, you can try to get a table at Tamura Ginkatsu-tei. This restaurant often has lines out the door during the lunch rush but for a good reason. Their most famous dish is the tofu, egg and pork soup, with sliced ginger to give it an addictive kick! 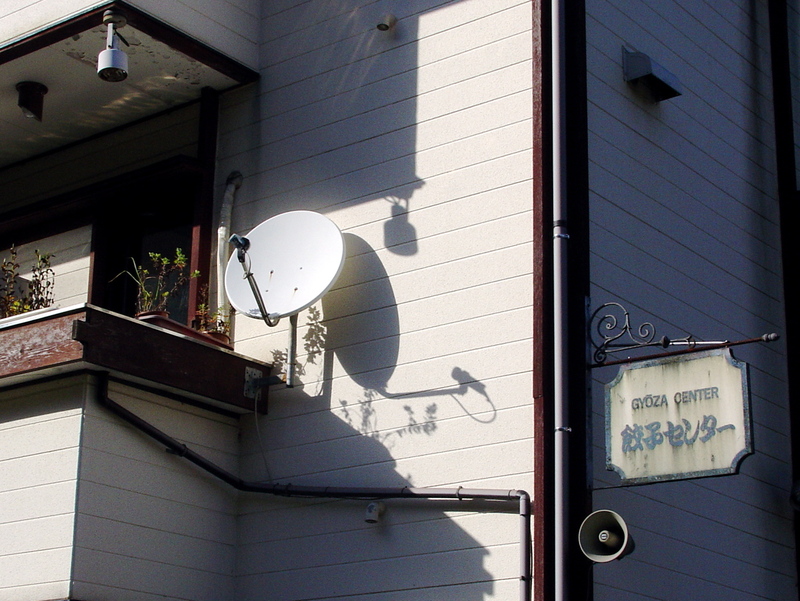 Once you’re finished eating, head back to Gora Station to get the cable car up to Sounzan station. Sounzan station is where you’ll transfer once more to the famous Hakone Ropeway up Mount Hakone. Each vehicle takes up to 18 people up to the top of the mountain and backs down to Lake Ashii with several stops in-between. From the highest point on the cable car, on clear days you have incredible views of Mount Fuji, and to the east, you can even see Tokyo! But, on most days, these are obscured by clouds and fog. That being said, the views even on a cloudy day of the surrounding valley are stunning, and during spring and fall, the colourful foliage looks like a multicoloured mosaic across the hillside. The first station off the cable car is Owakudani. Owakudani is an enormous volcanic crater in the centre of Mount Hakone. Although the area is still an active volcano zone, the last eruption was over 3000 years ago. Today, you can smell it long before you can see it. This is due to the sulfurous fumes which fill the air. As you start to come up over the mountain in the ropeway, you can see yellowish plumes of smoke billowing over the skyline. There used to be a hiking trail outside the ropeway station where you could talk to see steam vents and bubbling pools of sulfur but these days the fumes are so strong that the trails have been closed to the public. 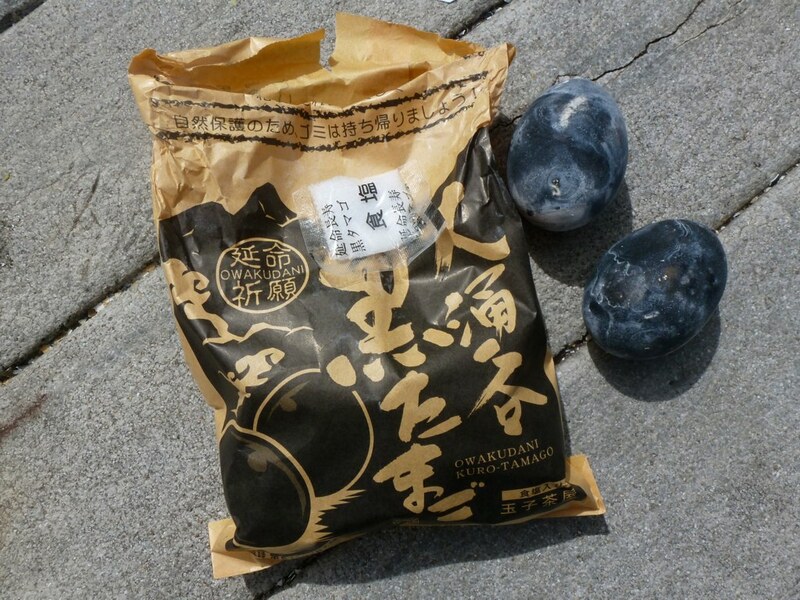 One of the most popular reasons people get off at this stop is to taste the famous black eggs. These eggs are cooked in the sulfurous water sand eating them is supposed to extend your life by seven years. They taste just like a regular boiled egg and can be purchased for $5 for 5 eggs. It even comes with little salt and pepper packet for favouring! $5 for 7 years of health and happiness?! Seems like a good deal to me! Get back onto the cable car and head down to Togendai Station. On the way down you'll have another chance to see Mount Fuji across the lake. Mount Fuji is known as the "shy mountain" due to the fact that you so rarely can see it! So take it as a good omen if you manage to catch a glimpse. Togendai station is where you can board the Togendai Boat Cruise across Lake Ashi. There are two type of tickets, regular class and first class. Regular class comes with your Hakone Free Pass but can be upgraded for an extra 500 yen. I wouldn't pay the extra money, it's not a very long trip, and the only advantage is better indoor seating separate from the regular class. It's a slightly more luxurious section and would only be worth it if the weather was terrible, and you knew you had to spend the entire trip inside. The boats leave every 20 minutes. If you have some extra time before your boat departs a walk around the lake is highly recommended. There are some cute swan boats beside the station as well which you can rent if you feel like taking a doddle around the lake yourself. The ships themselves are modelled to look like pirate ships. They aren't historical pirate ships, merely painted to look like them. While there doesn't seem to be any real rhyme of reason for this, the brightly painted red and green ships with gold trim do stand against the blue waters. The cruise takes about 40 minutes and on a good day is the best place to see Lake Ashi, the Red Torii gates of the Hakone Shrine and Mt. Fuji altogether. While sitting up on the deck can get a little cold, they sell hot cups of coffee and tea onboard, the perfect way to get comfy while watching the scenery pass by. I loved sitting up on the deck, the wind blowing in my hair, catching the last few blooming cheery blossom trees popping up in the distance. Most people chose to sit inside but I would recommend braving the cold, wind and rain for such a breathtaking experience. There are two stops on the cruise; one at Hakone Shrine and the other at Hakone-machi port, just to the south. I recommend getting off at the Shrine port. From here, it's only a short walk over to the Shrine itself. The Hakone Shrine is most well know for its torii-gate-on-the-water. And many people don't make it farther than that. I don't recommend doing this. Pass through the water torii gate and head up the enormous staircase to the top where the real shrine sits. Walking up the stairs, you'll pass underneath hundreds of cedar trees over 800 years old. Cedar trees are known to purify the air, therefore, creating a holy atmosphere around the shrine. At the top of the stairs you'll reach the shrine. This shrine is dedicated to the deity of love. You'll see dozens of couples hand-in-hand, praying for the blessing of the gods. Or single people praying that they too may one day find their true love. It's a legend that drinking the water at the shrine will help bring you luck in your romantic life! When I visited it was pouring rain and I couldn't help but thinking this was a good sign! After visiting the shrine, it will either be time to catch a bus back to Hakone Station to head back to Shinjuku or find your way to a hotel for an overnight stay. I highly recommend the Hakone Hotel. Located right on the lake, you have one of the best views of Mount Fuji (on a clear day). But on every other day, the iconic scenery of the lakesides is just as atmospheric. Inside the hotel are two onsens. One for men and one for women. They are incredibly beautiful and the perfect way to unwind after a long day on your feet! These onsens you'll find in almost any hotel in Hakone is a fantastic way to experience the city's illustrious hot springs for free (with the cost of your hotel). The only downside to an overnight stay in Hakone is many of the restaurants which serve tourists all day are closed for dinner. This is because most people who visit Hakone are day trippers and the restaurants can't stay open for only a few people. This means that your hotel is often your only choice for meals. While many of these hotels have incredible menus, they are usually pretty expensive. We opted for a 7-Eleven feast! The local 7-Eleven was only a short walk down the road, and from there we picked up a little bit of everything. Only in Japan would a meal from a convenience store look like an absolutely gourmet spread! We booked a Lake View room in our hotel and set up our dinner in front of the window, all the while watching the falling rain on the lake. It was incredible. Even with the raindrops on the water, the lake looked completely still. Peaceful and serene. Even if your hotel doesn't have any great views, make yourself a picnic and find somewhere along the waters edge to enjoy the scenery. Hakone is truly a wondrous city onto itself and although a chance viewing of Mount Fuji would be the icing on top of the cake, there are so many more amazing things to see and learn, you won't be disappointed even if you don't see it!